This past September when I ran the Under Armour Mt. Bachelor 50K, I had the opportunity to see a bunch of the cool trail shoes they had. 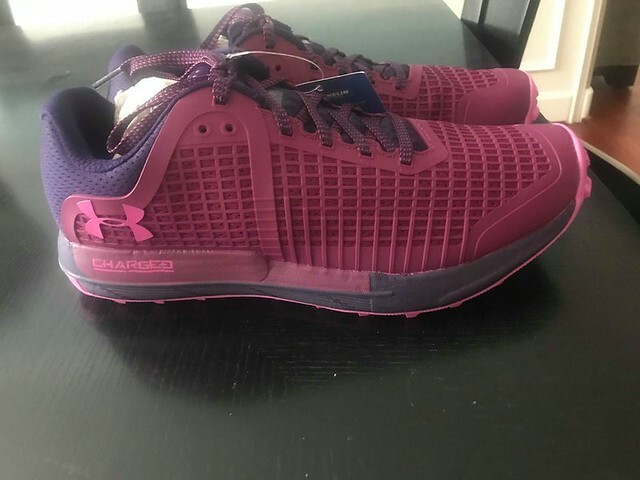 I have little to no experience with Under Armour products so I didn’t know what to expect but my friends at the race were more than excited to buy a couple pairs. I will say, I immediately thought they were sharp looking. The version they had at the race packet pickup was a black shoe with a gridded pattern. Most running shoes are VERY colorful and the simple black color was a nice change and versatile. 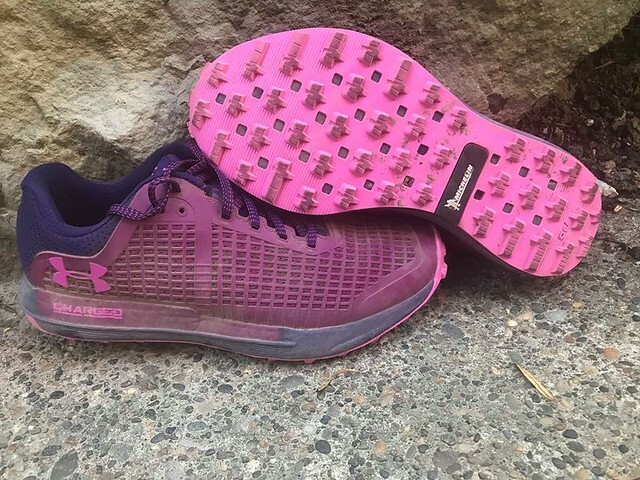 When the Under Armour Horizon BPF Women’s Trail Running shoe I was supposed to test arrived I was even more thrilled! It was bold raspberry color with the same grid concept on the top. As much as I loved the black, the raspberry was perfection. 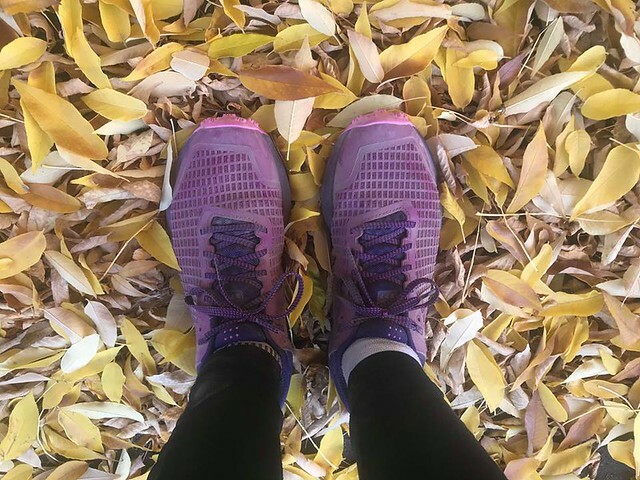 I had no idea what to expect with this shoe and seeing as I tend to get flareups in my feet when I don’t wear a proper trail shoe, I was a little nervous. But, I strapped it on and took it for a test drive around my favorite Forest Park trails. The first thing I noticed was the upper was solid but bent appropriately as I navigated through the twists and turns. The sole of the shoe was made of Michelin compound and led to phenomenal traction and grip. Although it wasn’t super muddy yet, I tried to hit some of the more technical trails to see how they dealt with the terrain. I never once felt a rock or stick through the bottom of my shoe. The area around the ankle was tight to allow for no debris to get into the shoe but didn’t dig into my ankles like I have experienced before. The grid pattern on top of the shoe proved to be for good reason, it knocked away the mud from sticking to the shoe. Though I will say that one of the only things that didn’t work well for me is that the rivets at the bottom hold clumps of mud in. Most of my trail shoes I can walk into my house with, but I can’t with these. They hold that dirt on the bottom and do not let it go! The only other downfall, which is very superficial of me, but the raspberry color turned pretty dusty raspberry after the first run and that vibrancy was lost. I am all about dirty and muddy shoes, but I loved the strong color and was sad to see a light dusting ruining that. Overall, the shoe was super comfortable and performed incredibly well on the trails. I was very happy with them and would definitely recommend them. I was pleasantly surprised by this shoe! Thank you to UnderArmour for providing us with some samples of Premium Instant Tea. Please read our transparency page for info on how we do our reviews.